The reduced height of the new Dell EMC PowerEdge R940 server chassis from 4U to 3U enables more enclosure density compared to the previous generation R930 chassis. The addition of Intel Scalable processors gives Administrators more cores to work with for virtualization and offers support for 30% more I/O capabilities. With top-of-the-line 28-core Xeon processors, this system delivers a 17% increase in performance over the R930 loaded with 24-core E7-8800 v4 processors again with 1U less space! This is a general-purpose platform designed for high-performance computing, data base, e-commerce, and data warehouses. The Dell R940 server is designed to be deployed as a dual or quad-socket platform with a Processor Expansion module (PEM) that supports two additional processors and 24 more memory slots. An optional two-socket configuration offers 50% more CPU bandwidth compared to a standard 2-socket server and is optimized for software-defined storage. The Gold and Platinum Intel Xeon Scalable family of processors are supported with the top of the line processors supporting three Ultra Path Interconnects (UPI) and up to 1.5TB of memory each. Other processors are also supported providing only two UPIs and only 768GB per processor. Three UPI channels offer greater performance throughput for quad-socket platforms, so if you want to access the full potential of the system choose your processors accordingly. Each of the processors supports six memory channels that can be populated with two memory modules each for a total of 12 memory slots per processor. With a two-processor configuration the PowerEdge R940 server will support a maximum of 24 memory modules and up to 3TB of memory. A four-processor configuration requires the addition of the Processor Expansion Module (PEM) that plugs into the motherboard right above the first processor and adds two more CPUs and 24 memory module slots. With four processors the system can support a maximum of 6TB of memory to address in-memory applications like SAP HANA. Administrators can install Registered (RDIMM), Load Reduced (LRDIMM), and 3DS LRDIMM modules running at frequencies of up to 2666MhZ. Up to 12 NVDIMM modules can also be installed providing 192GB of non-volatile memory for data resiliency. NVDIMM modules must be paired with Registered DIMM modules only. The speed of the memory is determined by several factors including; memory speed, processor speed, speed settings in BIOS, and the operating voltage of the server. The front drive bays on the PowerEdge R940 support up to 24 SAS or SATA HDDs or SSDs. You can also install up to 12 NVMe drives for a maximum storage capacity of 122TB. A Boot Optimized Storage Subsystem or BOSS allows you to use all of your up-front storage devices for storage. The BOSS delivers super-fast boot with dual M.2 drives that can be configured in a RAID 1 configuration for failsafe OS support. An optional internal dual SD module (IDSDM) with vFlash on the back can also be used for failsafe hypervisor support. The IDSDM now supports microSD cards instead of just SD cards and include capacities of 16GB, 32GB, and 64GB, with a 16GB vFlash card. Full-Height PERC RAID controllers are supported but only in slot 1 for the primary and slot 6 for the secondary PERC controller. Micro module HD Controllers are not supported. Several of the previous generation HD/RAID controllers can be installed on this system. However, the new Harpoon-based Premium Performance Gen14 HD/RAID controllers, like the H740P, are designed to get the most out of your SSD storage and I/O operations with more cache and support for 12Gb/s transfer speeds. There are 13 PCIe Gen3 slots on the system to maximize performance now and in the future. With a two-processor chassis configuration, the system will support seven PCIe gen3 slots (slots 1-7). Two additional risers can be installed on the Processor Expansion Module to support six more PCIe slots (slots 8-13). A Network Daughter Card gives you options for network connectivity with support for dual, and quad port 1Gb, 10Gb, and 25Gb options. There are also two USB 3.0 ports on the front and the back of the system each set with a dedicated iDRAC port. The Dell EMC R940 supports better management tools with the new and improved iDRAC 9.0 for out-of-band management of the system. Quick Sync has also been updated to Quick Sync 2.0 to provide compatibility with both iOS and Android smart phones and tablets. Like its predecessor, the R930 the Dell EMC PowerEdge R940 server is one of Dell’s most powerful server platforms. 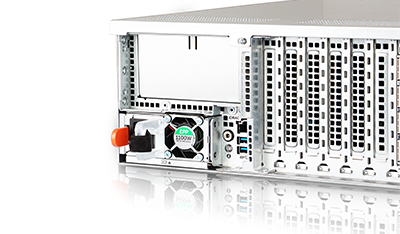 The 3U chassis on the new generation provides significantly more server density than the 4U chassis on the R930 but also offers more storage, more memory, and more I/O to tackle just about any mission-critical application.